Philips has produced the TVs with the best build quality for as long as we can remember, and that continues with the ballistic Philips 46PFL8008S. The unusual skeleton desktop stand is hardly there at all and creates an almost floating look, and unlike many, it swivels, too, while the TV's metallic materials are high-grade and gorgeous. The 8mm (0.3 inch)-wide bezel (which tapers back to 12mm/0.5 inches) will impress, as will the 32.5mm (1.3-inch) depth, though it's what's going on behind that will really blow your socks off. Ambilight in its three-sided XL flavour - an array of 36 LEDs studded to the back of the Philips 46PFL8008S's frame - puts on a dynamically changing light show across the walls behind the TV. Tech-wise, the Philips 46PFL8008S uses a 200Hz, edge LED-lit panel that boasts a dual-core processor within - something that's increasingly crucial to make the extra smart TV-rated features usable. Talking of which, this TV does have a half-decent collection of apps, though BBC iPlayer, Netflix, Blinkbox and Netflix are the only real highlights. Perfect Pixel HD ties together some advanced picture options, while 3D - in the active shutter 3D Max guises - puts in a stunning appearance. However, the real advance on rivals is the use of two subwoofers on the Philips 46PFL8008S's rear; they plump out the rear of the TV a tad, but by golly it's worth the sacrifice. Not only is it the best-looking TV around, the Philips 46PFL8008S is also one of the best-sounding we've heard since TVs got thin. This 46-inch Philips 46PFL8008S - priced at £1,500 - is the smallest in Philips' 8000 Series for 2013 below the range-topper, the 55-inch Philips 55PFL8008S (£2,500). Further up is the flagship 9000 Series, whose annual iterations regularly bother the 'Best TV of the year' awards. 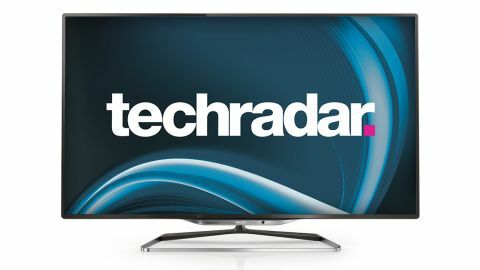 Come September we fully expect the 9000 Series to be reborn as a lineup of rather large Ultra HD/4K TVs, but for now we can only tell you about 2012's stunner, the 46-inch Philips 46PFL9707S (£2,500). The Philips 46PFL9707S could very well be the only LED backlit LCD TV remaining on sale that offers the slightly thicker, but far better, 'direct' LED system. Most other LED TVs on sale now - including the Philips 46PFL8008 - use Edge LED lighting that fires in the brightness from the sides of the screen. It's less accurate, but it can still produce marvellous results. The Philips 46PFL8008 has a Full HD resolution, 200Hz panel, it sports cutting-edge good looks, and inside is a Freeview HD tuner, but the first thing you'll notice about the Philips 46PFL8008S will likely be its unique Ambilights. Here, the system is described by Philips as Ambilight three-sided XL, which constitutes strips of LED lights (nine on the sides and 18 across the top), though they're all around the back and totally out of sight from the normal viewing position. It's clever stuff - once you've told the Philips 46PFL8008S what colour your living room (or home cinema) walls are, it monitors what colours are being displayed on the TV screen in real-time, picking out the dominant hues and projecting a calculated mix on to the walls around. What you get is an ever-changing light show that's supposed to 'intensify' your involvement in whatever you're watching. If your living room is at the front of a building it can have an alarming effect on what light is projected out, but the dynamics of the system can be tweaked and relaxed quite easily. We love it. High-end TVs rarely skimp on the ins and outs, and the Philips 46PFL8008S is no different. In the box are a couple of adaptors for those wanting to hook up Scart or component video, though the onboard slots are plentiful. The rear holds three downward-facing HDMI inputs, an RF aerial for powering its built-in Freeview HD tuner, a Scart adaptor jack and a digital optical audio output. Just above is an outward-facing wired Ethernet LAN port, some basic audio ins and an adaptor jack for component video. A side panel adds a fourth HDMI alongside a stunning three USB slots, a headphones jack and a CI slot. You'll need a 4GB USB flash drive for pause live TV features, and an HDD of at least 250GB for making recordings from Freeview. There's a Wi-Fi module inside that gets the Philips 46PFL8008S online and also powers Wi-Fi Miracast, a screen mirroring tech for Android phones. Wi-Fi also helps with the Skype system, which on the Philips 46PFL8008S enables native video calls thanks to its pop-down camera. We're pretty sure that's a unique design choice, since most such cameras on LG, Samsung and Panasonic TVs are situated on the top of the TV. The Philips 46PFL8008S does have Philips Smart TV included, but don't expect industry-leading antics on this front. It's nothing to get upset about, since all the major apps are here, but there are plenty missing, too. In our test we counted apps for BBC iPlayer, Blinkbox, Netflix, iConcerts, Muzu.tv, YouTube, Facebook and Absolute Radio on the front page, though around a dozen others are also available to download. The email and web browser widgets demand the attentions of one of the Philips 46PFL8008S's star features - its double-sided remote control. It's a well-made item indeed, which uses great quality materials and holds a nicely spaced-out array of buttons on one side, and a QWERTY keyboard on the back. The QWERTY keyboard is split into two halves, with a large space in between, to make it a thumbs-only experience. It's a wise move - and the remote control acts as a Nintendo Wii-style pointer remote, too. A MyRemote app is available, which powers SimplyShare digital media sharing and some cloning of live TV channels (that run about 10 seconds behind), while the Philips 46PFL8008S also includes 3D Max (active shutter 3D) and 2D to 3D conversion of any video source. However, it's the constant refinements of Philips' picture processing suite, Perfect Pixel HD, that proves to be the most critical to the Philips 46PFL8008S's success.